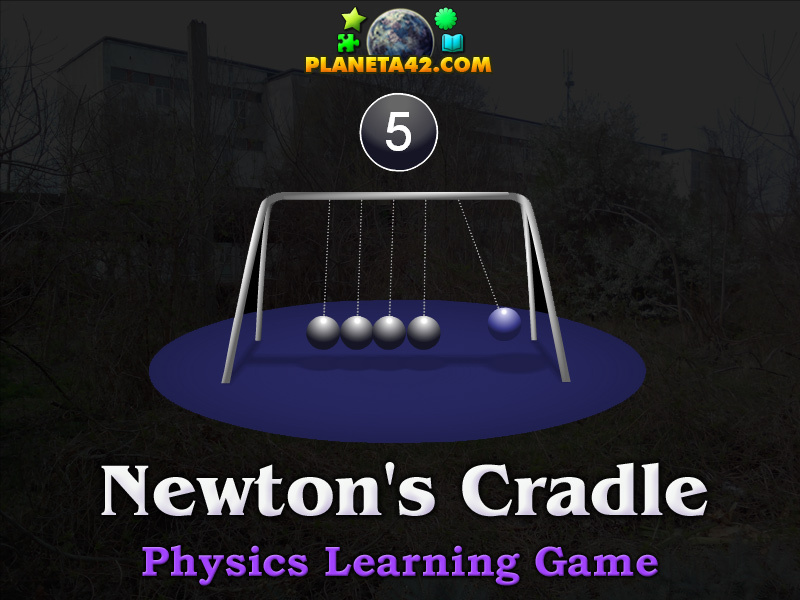 "Newton's Cradle" is a free online knowledge level app to pull the balls and explore the Newton's Cradle. Minute to win it game. Physics learning game, suitable for online classes and interactive lessons. 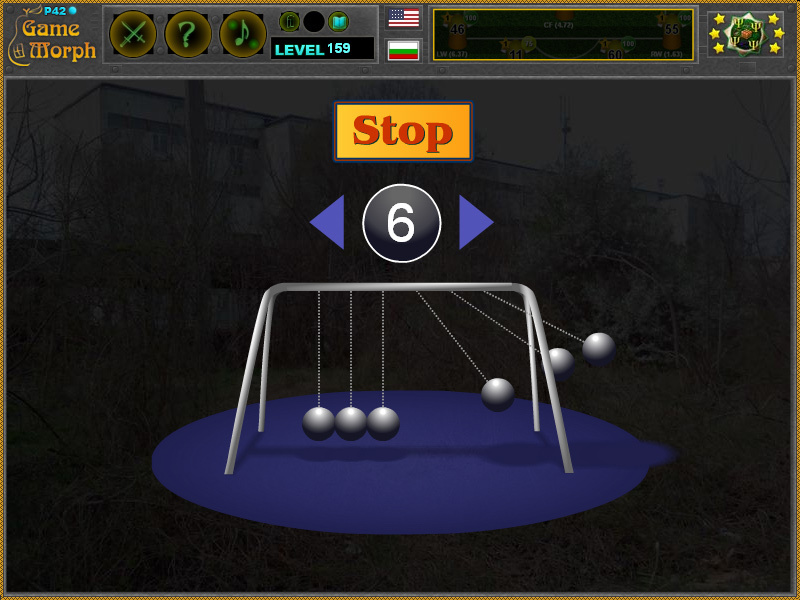 Fun physics educational app to swing 3 to 7 steel balls hanging on a stand and see how they react. Part of the Interactive Physics Workshop educational tools. Online physics game. Game code by Strille. Background picture by Ogo Bob. How to play Newton's Cradle Puzzle. There is the Virtual Newton's Cradlem starting with 5 steel balls. Drag and drop one of the side balls to swing them and see how they react. Then try to swing some of the inner balls. Use the arrows to increase or decrese the number of the balls. And use the stop button to calm the balls. Know about the Newton's Cradle. No level achievement for this app. Newton's cradle is a device that demonstrates conservation of momentum and energy using a series of swinging spheres. When one sphere at the end is lifted and released, it strikes the stationary spheres, transmitting a force through the stationary spheres that pushes the last sphere upward. The last sphere swings back and strikes the still nearly stationary spheres, repeating the effect in the opposite direction. The device is named after 17th-century English scientist Sir Isaac Newton. It is also known as Newton's Balls or Executive Ball Clicker. A typical Newton's cradle consists of a series of identically sized metal balls suspended in a metal frame so that they are just touching each other at rest. Each ball is attached to the frame by two wires of equal length angled away from each other. This restricts the pendulums' movements to the same plane. When one of the end balls ("the first") is pulled sideways, the attached string makes it follow an upward arc. When it is let go, it strikes the second ball and comes to nearly a dead stop. The ball on the opposite side acquires most of the velocity of the first ball and swings in an arc almost as high as the release height of the first ball. This shows that the last ball receives most of the energy and momentum of the first ball. The impact produces a compression wave that propagates through the intermediate balls. Any efficiently elastic material such as steel does this, as long as the kinetic energy is temporarily stored as potential energy in the compression of the material rather than being lost as heat. There are slight movements in all the balls after the initial strike but the last ball receives most of the initial energy from the drop of the first ball. When two (or three) balls are dropped, the two (or three) balls on the opposite side swing out. Some say that this behavior demonstrates the conservation of momentum and kinetic energy in elastic collisions. However, if the colliding balls behave as described above with the same mass possessing the same velocity before and after the collisions, then any function of mass and velocity is conserved in such an event. Labels: Physics Games , Orders of Magnitudes , Classroom Games , Education Games , Free Online Games.